Come out today and cheer on the Lee Basketball Teams! Game are at home today vs Indianola: B team girls game starts at 3:00. Tuesday is the last day to turn in contracts and pay money for the Christmas Dance. Permission Slips for the Math Competition are due. Exams begin Wednesday. 1st Period Exam starts at 8:00- 9:302nd Period Exam starts at 11:00-12:30. Students who are not able to go home between exams may stay and study. Don't forget to purchase your "Lee Academy Stocking Stuffers" in the office! We have great looking hats and visors made by "The Game" reduced to $15 each through Christmas. We also have Family Secrets Cookbooks, Under Armour Polos, Spirit T-shirts, and extra Homecoming and Winter Formal T-shirts. ALL make great holiday "happies" and stocking "stuffers"! Juniors and seniors interested in a dual enrollment course through CCC second semester, meet with Mrs. Antici at break in the library.There are several courses offered on-line or on the CCC campus. 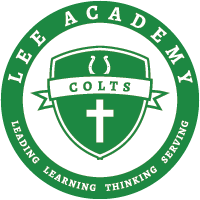 The College Algebra course will be taught on the Lee Academy Campus. Angel Tree Gifts are due at the schooltoday. This month’s project for the entire school is canned goods for the Care Station. All canned goods need to be in by Monday. The following Key Club members will attend and host the special needs party at Booker T. Washington on Tuesday, December 13. They will leave at 11:15 and return by 1 p.m. Members, please remember to wear something Christmas-y! Reminder to Key Club members. Turn in your hour sheets to Ms. Hopkins as soon as possible!